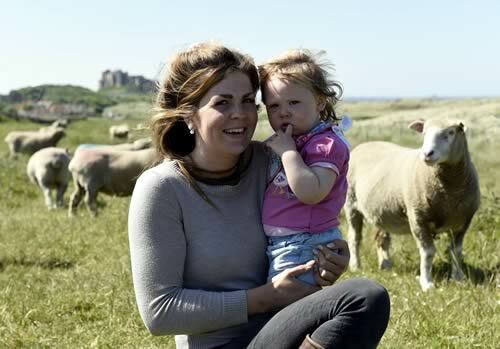 Christina Johnson shares the passion for the docile Dorset breed with her father Alistair who established the flock in 2008 and now she has taken over the running of the sheep from him at Fowberry Farm, Bamburgh, on the picturesque Northumberland coast. The 50-ewe pedigree Bamburgh flock grazes 150 acres of parcels of mostly rented ground in the shadow of Bamburgh Castle along with a herd of 60 commercial Aberdeen Angus suckler cows and followers. The system perfectly suited organic management, which the farm has been under for 10 years, although increasing costs and less of a premium for the organic stock sold is leading the Johnsons to re-consider the viability, although their preference is low inputs of pesticides and bought in feed. The 60 suckler cows which are crossed with the pedigree Angus bull achieving more and more pure bloodlines have 20 heifer calves, half of which are retained to maintain the herd and the rest are sold for breeding. Bullocks are sold through the ring at 18 months old achieving prices of up to £1,250. Christina, 25, with her mum Lesley, manages to juggle running the livestock enterprise and the Caravan Club five pitch CL campsite at Fowberry with looking after her young daughter, Henrietta. Her partner, Henrietta’s father Simon Gregory and his family farm at the neighbouring Springhill farm and he is on hand to help out. “My Dad has always been one to research things and he decided on going into Dorsets in 2007 when he bought 20 ewes from the Sydling Estate in Dorset in 2007, registering the flock the following year,” said Christina. “I love the sheep. They are so easy to work with and so docile and they are a hardy sheep. Their ability to lamb at any time of year is perfect for us as we calve the cows in March and April and then we have all the visitors for the camp site during the summer,” she added. Over the last seven years flock numbers have been increased to 50 ewes with a further 25 to 30 ewe lambs, around 10 of which will be kept as flock replacements. No females have been bought in with five of the original ewes still in the flock. Only rams have been purchased, selected mainly on their EBVs, to improve the bloodlines and genetics. Rams have been bought principally at the Dorset association’s annual May Fair in Exeter. The first was from David Rossiter’s Huish flock in Devon, Huish Liam which has made its mark on the flock. Manorcroft Pride was bought from Tom Clarke’s flock in Crediton, Devon, and more recently, Downkillybegs Union Jack from Northern Ireland breeders William and Karen Carson. An investment of up to 1,000gns is usually made in a ram. The ewes lamb from the beginning of September for a month with a view to producing ewes and rams for sale at the May Fair. The lambing percentage runs at 200. In 2015 for the first time ewes lambs were lambed successfully and without any assistance in January. “They all lamb outside in as tight a period as possible. We bring them in to carry out the usual procedures and then turn them out again. Rams are also sold at the NSA Kelso sale and at the Dorset society sales at Chelford and Carlisle. So far, the top price has been for the ram sold at the 2012 May Fair Bamburgh Boje for 850gns. The Bamburgh flock has been Signet recorded since 2010 and, with the use of mainly recorded rams, the flock’s overall EBV for both maternal and terminal sire traits is improving year on year. Rams are in demand from commercial breeders but the ultimate aim is to sell rams to other Dorset breeders. “I am continually trying to improve the flock by sticking to selecting rams on conformation and good EBVs,” said Christina, who studied food and agriculture at Harper Adams University for a year before returning to the farm in Northumberland. The ewe lambs this year were put to the 2014 May Fair purchase, Sherborne Warfare from Rob Hole in Dorset and the ram is likely to be put to this year’s ewe lambs for January lambing. All the Dorsets are bred pure and all females which are not retained as flock replacements are sold for breeding, mostly through the ring at Carlisle. All the male lambs are kept entire and those selected for breeding are either sold through the ring or privately - one purchaser has been Richard Hodgson, of Red Stead, Howick, near Alnwick, who has been using a Dorset ram from the Bamburgh flock to cross on Texel ewes. Dorset Horn and Poll Dorset ewes and rams come under the hammer at Borderway, Carlisle on Friday August 28, on behalf of the breed association.